In all things that God has created, the transformation stage to reach maturity and reveal what is expected by the eyes of man, will surely come to pass with the passage of time , As such, Zambia’s sustainable development prospects in relation to our human development aspirations will be attained with the passage of time despite what our daily experiences are , which keep on revealing our responsibilities that lie ahead of eternity’s glories and mercies. We are seeing the developments that Zambia has achieved from the time we got our independence to date. We are also aware of what needs to be done in our quest to develop the nation. In order to attain higher levels of these spheres of our national development aspects, we must be mindful that the financial resources that are required for the government to effectively deliver it’s government societal functions are enormous and it’s the major hindrance to the attainment of our human development aspects to equilibrate better standards of living conditions to the people of Zambia and at the global level. We must come to terms and have an insight of the current existing global development levels, in relation to our natural resources at our disposal , the use of technologic advancements, technologic transfer in the transformation of our natural resources to produce finished goods and services in order to harmonize the prevailing social iniquities, which work against the principle of equal opportunities for all mankind and creation. We must also be mindful that the current situation we are going through are a part of our daily lives at the global, family and individual level. This situation does not mean that we have failed to work and therefore should abandon the plans to carry out our work. Our current standard of living conditions and situations as been experienced should not blur our support to the government’s commitment in delivering the services to the people. Therefore our sustainable development prospects lie in the existing political leadership including those aspiring to leadership to contribute to the development of our common national and global human development by way of forecasted planning, organization, administration and blending to create one mixed lump complete with mixed leadership and hierarchy with such a broad theological base that we believe in almost everything political parties, civil society and NGO’s we propagate to us ,now and beyond our lifespan. By this approach of forecasted development planning, the citizen’s assimilation and articulation of national issues that need to be addressed by political parties, civil society and NGO’s in the nation will be understood by the people governed, so that they make rational decisions in supporting our common cause. This is one of the most favored option to bring about a positive way of managing our national affairs holistically to avoid trying to run the country on emotions because any change of government on emotions will not bring about the desired positive change, our debates on how the country is expected to be administered will not be centered on name calling and character assassination because they do not offer us alternative theoretical and practical models and means to address the challenges and problems the country is facing. Let us be mindful that without theoretical and practical forecasted national development plans , a change of government will definitely have a lot of impediments to run and develop the country for a period not less than 18 months. Zambia is in the global village and has being implementing it’s development plans with bi-lateral,multi-laterals. Cooperating partners who work with us according to international social, economic, political and environmental norms and fundamentals. This is because our bi-lateral, multi-laterals. Cooperating partners will want to observe and see what the new party in government plans to do. This can not be done in 90 days nor 12 months as development plans are implemented on an annual basis and it’s only after 12 months that cooperating partners can see the way forward. The assistance rendered to the country by any bi-lateral,multi-laterals. Cooperating partners in whatever form is an investment which has to be guaranteed to produce the desired results and effects to the nation. Therefore our judgment and our ability to debate the implementation of our national development plans should be based on the forecasted development agenda by the government amid the different views on how we think the country is should be run. Let us ask a s a nation our leaders in ruling party, opposition political parties, civil society and NGO’s at provincial, , parliamentary and local government levels to explain to the people as to what plans the government has put in place to address developmental issues. This will enable the people to have a clear vision on the direction the country is moving in . By people having a clear vision in terms of development aspects in the country, Our unity is going to a have a purpose as we strive to make this country a better place for generations to come through millennia. The citizens will then have a broad view of the alternatives of what is also expected of them to contribute to national development incase of any outcome of presidential, parliamentary and local government election results because change is always based on continuity. The people will in turn be able to gauge the performance of ruling party, opposition political parties, civil society and NGO’s. From our colonial era and since independence the ruling party in government, opposition political parties, civil society and NGO’s have put in a spirited approach to delivering development to the Zambian people. They must be given acknowledgment for their sacrifices to the work that has been done and still lies ahead of us. The ruling party, opposition political parties, civil society and NGO’s come and go through any government institutional, constitutional and statutory fundamental to make a contribution to any nation towards our universal global human development aspirations for the preservation of love, peace and harmony for now and the future. In view of the said observations the mere presentation of ruling party, opposition political parties, civil society and NGO’s constitution and manifestos must be accompanied by a detailed forecasted development plan for a period not less than 20 years to offer as an alternative on how best the will run the government when given the chance by the people to run the same. This is evidenced by what we have gone through when the country attained change of government in 1991. Our Cooperating partners who work with us according to international social, environmental, political and economic norms and fundamentals wanted the incoming government to implement structural change to be in line with global operating norms to continue giving assistance to the country .e.g. Structural adjustment programme, privatization of state run companies etc. To this effect, the ruling MMD party in government implementation of development programme is on course and bearing results, so far as the fundamentals that are required to run the affairs of the nation are concerned. More work still needs to be done on constitutional and statutory matters etc. The MMD government has now produced the Sixth National Development Plans (SNDP) including the 2030 Vision to develop the country. These are theoretical and practical models that they are using to address and deliver development to the people now and beyond. 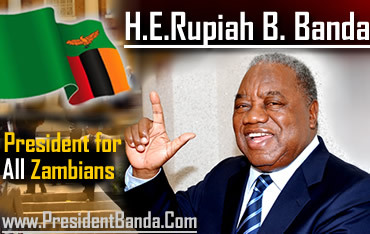 In conclusion, we are few days away from the 2011 presidential, parliamentary and local government elections President Rupiah Banda and the MMD party is the best choice for the people of Zambia for prosperity in love, peace, harmony, social, economic and environmental development because the opposition political parties are not propagating theoretical and practical ways and means that they will undertake to develop the country. The views in this write-up belong to the author, Nkumbula, not the necessarily the Zambian Watchdog.